Halloo - How can I use Instant Messaging to monitor and control incoming calls? How can I use Instant Messaging to monitor and control incoming calls? One of the most useful and powerful features of the Halloo phone service is the ability to monitor and control incoming calls using a standard instant messaging (“IM”) client. Here’s how it works. You set up IM notification by configuring your Halloo account with your Jabber account ID. If you do not already have such an account and appropriate software client, read on for more information on how you can obtain the necessary service and software. 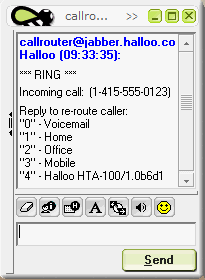 When an incoming call is received for your Halloo phone number, the Halloo phone service will send you an instant message informing you of the incoming call, including the Caller ID, if available, and offer you the option of redirecting the call to any of your call forwarding numbers, or voicemail. You need not take any action unless you wish to re-route the call. In this image, you can see that the incoming call was identified by caller ID, and the user chose to send the call directly to voicemail. The decision to redirect the call must be made before the call is answered or sent to voice mail. The caller never knows that his call was screened or re-routed. As an example of how this feature might be used, let’s say that you are at your desk, but you have your calls forwarded to your cell phone. You prefer to receive your calls on your desk phone because of the better voice quality, or to save your cellphone’s batter charge. When a call comes in, just type the option number that identifies your desk phone, and don’t forget to hit the return key to cause your IM client to send your response. Now your cell phone stops ringing and your desk phone starts ringing. If you step away from your desk, take your cell phone with you. You won’t miss any important calls, since they are still forwarded to your cell.